Well, it's Wednesday. You know what that means! Copic Colour Challenge day! I was a happy bunny when this weeks colours popped up - thanks Karen! Karen chose BV02, G02 and B32 - such a pretty combo. This combo also gave me a very good excuse to purchase last year's Pink Petticoat spring papers that I've wanted for ages! This card went a bit wrong to start with but luckily I was able to rescue it. I tried using chalk to give a funky background to the image but.... it just looked rubbish! So I reprinted my image, recoloured it and bunged it over the top! As good as new, don't you think?! Stamps: Girl Singer by InStyle. Paper: Spring Wishes by Pink Petticoat. Copic Markers: BV00, BV02, BV04, G00, G02, G05, B32, W1, W3, W5, W7, YR23, Y21, E00, E11, E50, R20, R22. 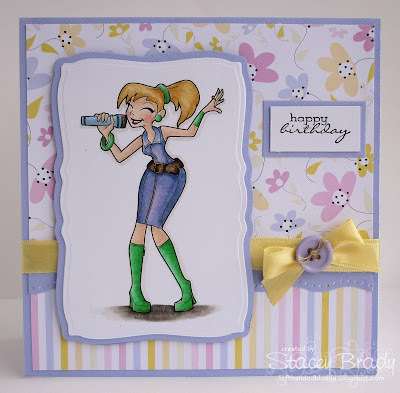 Tools & Embellishments: Nestabilities, ribbon and button from stash, EK Success border punch. It's very pretty Stacey! and I agree the colour combo looks fab! I love the splashes of green! AWW Stacey what a fun image and these colors are wonderful! Oh fabulous card Stacey, love the sweet image and the pretty colours.